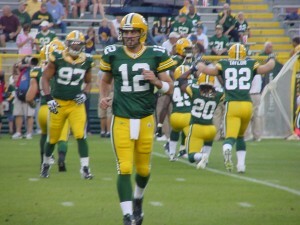 Aaron Rodgers comes off the field during a recent home game. For some reason, the ones that should know better, don’t. Former players like Ron Jaworski and Merrill Hoge once again made critical comments, accessing Green Bay Packers quarterback Aaron Rodgers game. Jaworski said, “He’s missing far too many guys that are open, not staying calm and comfortable in the pocket and delivering the ball on time.” Hoge said Aaron is “rattled”. Rodgers took his frustrations out on the Houston Texans last Sunday night. Rodgers threw for 338 yards and 6 touchdowns as the Packers pulled out a 42-24 win. Rodgers missed one opportunity early to James Jones down the left sideline, but that was about the only thing that he missed the rest of the night. One thing is certain. If you get under Rodgers skin, he’s going to take it out on his opponent on Sunday. The Houston Texans found that out the hard way last Sunday night. The Rams could be facing the same trouble this Sunday. Story from Bill Scott of Wisconsin Radio Network.